A YouTuber has reignited discussion on the Kenya national anthem's ownership rights after revealing how a UK based company has claimed copyright. The channel, 2nacheki, received a YouTube strike (warning) over a video it posted that attempted to rank Africa's best national anthems. The claimant of the copyright to Kenya's anthem was De Wofle Music, a UK based music company. De Wolfe has on its page published an orchestral arrangement of Kenya's national anthem that it states was created in 1990. 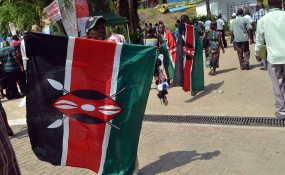 Kenya Copyright Board (Kecobo), in a response on Tuesday, explained that Kenya's national anthem had copyright for its commission that worked for 50 years. This lapsed in 2013. Further, the Copyright Act has not been amended to expressly state that the anthem, although its copyright has expired, its use is still regulated by the law. Kecobo wrote; "Arising out of this incident, there is a need to further secure the use of these national symbols by making amendments to the Copyright Act to expressly state that even where copyright in certain government works is expired, the use of such works shall still be subject to authorization as required under the National Flags, Emblems and Names Act." The board said it is consulting with other state departments to prevent unauthorized copyright of the anthem. "Kecobo is at the moment studying the terms and conditions in YouTube platform with a view of requesting for a take-down of all content offending the National Anthem by the said Company and others as well," the board added. Several columnists have written on local media on the need to amend the Copyright Act to protect the national anthem after its copyright expired. Paul Kaindo, an advocate and a legal counsel at Kecobo, had on December 17, 2018 written on Business Daily that there was need to protect the anthem from commercialization. Nairobi News has reached out to De Wolfe and by the time of publishing the company was yet to respond. The company has published other arrangements of different national anthems including that of China, United States and Great Britain. From its indication on the channel cover image, De Wofle has since moved from its channel where these orchestras are published.